We offer everyone the opportunity to view ALL of our previously advertised board vacancies in the belief that showing you the roles we have advertised in the past is the best way to show you the kind of roles you should expect from us in the future. 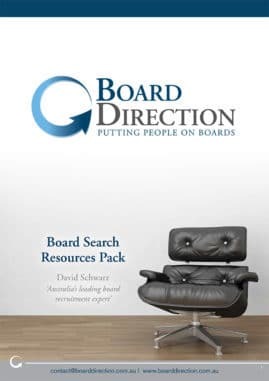 Board Direction offers access to Australia’s largest list of board vacancies – over 3,500 annually. How can we access so many opportunities for our members? There are two reasons: 1. Unlike other firms, it is completely free to advertise with Board Direction – meaning there is no barrier stopping organisations to utilise our services. 2. Our vacancies are personally sourced by the team at Board Direction – not bots or scraping, just hard work. Together this means our member have access to the largest and most diverse list of board vacancies – opportunities spanning the public, private and not for profit sectors. So, if you: have been considering a board appointment for some time but don’t quite know where to begin; already have a board role but are struggling to find your next appointment; already have a successful career but want to compliment it with a board directorship or; are struggling to find the time to search for opportunities then … Board Direction is for you. With over a decade of experience putting people on boards and advertising over 2,500 board opportunities annually plus a offering suite of training and accountability services we have what you need to turn your aspirations into reality. If you are not already a member JOIN NOW or Log In to access the details of all our current board vacancies.